A CASE STUDY: THE MEMORY OF H.M. In Unit 1, the Cognitive Approach requires that you understand case studies and the case of H.M. in particular. H.M. was studied for his entire adult life after his operation. The 1957 case study cited above was simply the first of many carried out by Brenda Milner and her former-student, Suzanne Corkin. This case study was carried out by William Scoville (left) and Brenda Milner (below left) in the 1950s. It was a key piece of research that established that memory is linked to the hippocampus and composed of different functions. It shows how scientific research proceeds, because before this case study, psychologists assumed memory was a single function that occurred throughout the brain. This study demonstrated that memory consists of different functions linked to different parts of the brain. Henry Gustav Molaison has been called the most important patient in the history of brain science. Henry suffered from epilepsy caused by a head injury when he was seven. As he grew up, his seizures got worse, until surgery was his only hope for relief. The pioneering brain surgeon William Beecher Scoville proposed to remove the part of the brain that was causing the seizures. Henry agreed to the operation. In 1953, when Henry was 27, Scoville performed bilateral medial temporal lobe resection. This involved removing part of Henry’s temporal lobe, including parts of the hippocampus and amygdala. Resection is still used today to treat epilepsy, but with the aid of lasers and detailed brain scans. Scoville didn't have these tools and wasn't even aware what the hippocampus did. Modern patients don't suffer the side-effects that H.M. did. When Henry recovered from the surgery, he suffered from severe amnesia. He could remember his childhood: he knew his name and family and could remember the stock market crash of 1929. However, he struggled to remember the years leading up to the surgery and had gaps in his memory of the 11 years before. Even more importantly, Henry had severe anterograde amnesia. He lost the ability to form new memories and forgot everything that happened to him in a matter of seconds. 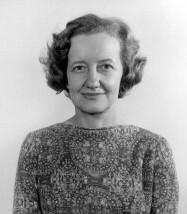 When it became clear how severe the side-effects of the surgery were, a young researcher named Brenda Milner conducted a case study on Henry Molaison and compared her findings with Dr Scoville's medical procedures and published the findings in 1957. She protected Henry's identity by referring to him as "H.M."
The case study caused a sensation and is one of the most widely-cited psychological studies ever. It changed our understanding of memory and the brain. Milner carried on testing H.M. and published the results between 1962 and 1972, demonstrating the existence of procedural memory. Meanwhile, H.M. had become a full-time research participant, under the supervision of Suzanne Corkin at MIT, who carried on publishing studies (and, in 2013, a book about H.M. called Permanent Present Tense). H.M. died in 2008, at the age of 82. His much-studied brain was removed and scanned using MRI. It was then sliced into 2401 pieces, each just 70 micrometres (millionths of a metre) thick, and turned into slides that would help researchers to map the brain. To investigate the extent and nature of H.M.'s memory deficits and how they relate to his brain damage. 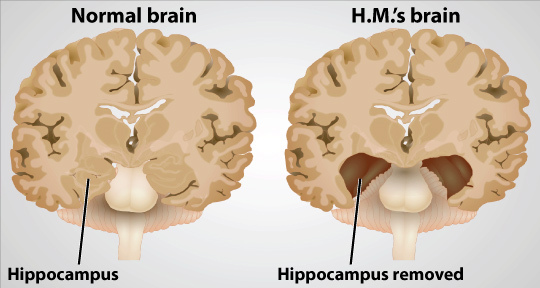 In particular, Milner (and later, Corkin) investigated the structure of memory as revealed in H.M.'s behaviour and the function of brain structures like the hippocampus. One adult male, H.M., aged 27 at the start of the first case study. H.M. suffered from both retrograde amnesia (loss of memories from before his brain operation) and anterograde amnesia (loss of memories after his brain operation). In fact, in Scoville & Milner's original study, 9 of Scoville's patients were described. However, since they suffered from disorders like schizophrenia, the resection didn't remove their symptoms. H.M. was the only one with "clean" amnesia - memory loss but no other mental problems. 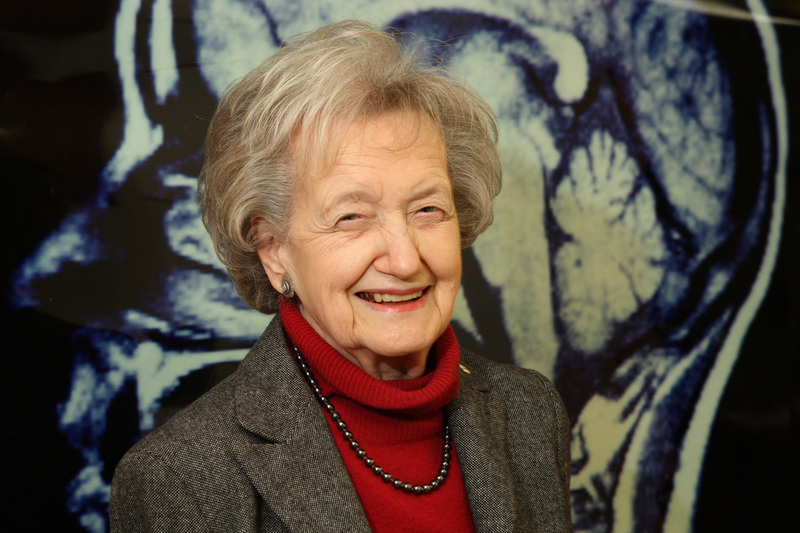 Brenda Milner's early tests were simple recall tasks, testing H.M.'s ability to recall events from his childhood, from his adult life before the operation and from his experiences after the operation. She also tested his short and long term memory recall. Finally, she tested his other cognitive faculties, like IQ, perception and general knowledge. Milner also tested H.M. with maze tasks. H.M. attempted to trace the correct route through the maze with his finger. Milner then tested him over and over with the same maze to see if H.M. would remember the route, even if he didn't remember having attempted the task before. 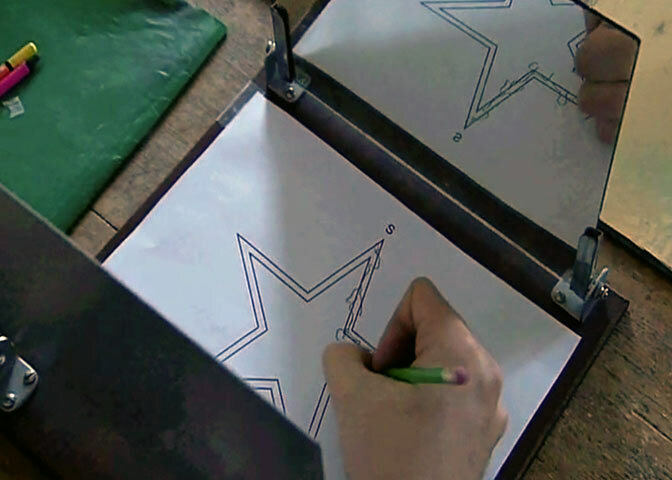 In the 1962 case study, Milner asked H.M. to copy a five-pointed star by drawing between the lines of a template. However, H.M. could only see the reflection of the star and his hand in a memory. This made the task difficult. As with the maze task, Milner asked H.M. to re-attempt the task many times, to see if he grew more skilled at the procedure even though he didn't remember doing it before. Other tests were carried out on H.M.. For example, the effect of reinforcement and punishment was investigated, to see if mild electric shocks would help H.M. to remember correct answers. Later, under the direction of Suzanne Corkin, brain scanning technology was used to improve our understanding of H.M.'s condition. Matteo Farinella's cartoons sum up the case of H.M.
H.M. forgot all new experiences after about 30 seconds; however he remembered a lot of information from before his sixteenth birthday. His personality was consistent, he had good language skills and an above-average IQ. His perception was normal, except for his ability to identify smell, which was very poor. H.M.loved to describe clear memories of his childhood, over and over, though he lacked a context for them (like how long ago they happened). The face he saw in the mirror surprised himself. Every time H.M. met Milner (and later, Corkin), he introduced himself as if they had never met before, and told his stories again. of himself that had been taken on his 40th birthday in 1966.
music was. He learned how to play tennis, although he could not remember being taught the skills and denied that he knew how when asked. Over 252 attempts, H.M. never showed any improvement in the maze task. 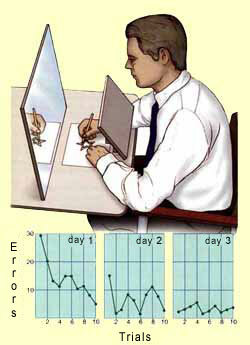 However, H.M.did show improvement in the star-tracing task, making fewer mistakes on each attempt. He started with 30 errors, dropping to 20 on his second attempt and 10 by his seventh. Moreover, he kept these skills from one day to the next, getting better and better at it: on Day 2 he started making only 25 mistakes, immediately dropping to fewer than 10; by Day 3, he was making fewer than 5 mistakes each time. Attempts to test punishment with electric shocks had to be abandoned. H.M. possessed huge tolerance for electric shocks, barely noticing shocks that normal people found quite painful. He also seemed to have difficulty noticing feelings of tiredness and hunger. Milner's qualitative data shows a clear difference between short term and long term memory. 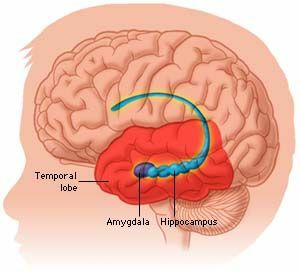 They suggest that the hippocampus plays a vital role in transforming short term memories into long term memories, because this was something H.M. (whose hippocampus had been removed in the operation) couldn't do. H.M.'s poor ability to identify smell may be linked to the fact that the olfactory bulb - which processes smell - is located close to the hippocampus. H.M.'s poor response to pain and confusion over hunger and tiredness probably links to the damage to his amygdala, which also explains his calm response to the situation he found himself in. Milner's quantitative data and the later qualitative data suggests a more complex structure for memory. H.M. did not improve at the maze task because, when he figured out the correct route through the maze, he immediately forgot it. However, he got better at the star task, despite forgetting his previous attempts. Later in life, he learned to play tennis. This suggests H.M. remembered skills even if he forgot events. H.M. also remembered some items of general knowledge (the moon landings, the Kennedy assassination), even though he couldn't remember the events taking place. Milner termed this sort of memory "unconscious memory", but Eron Tulving later termed it procedural memory (skills) and semantic memory (general knowledge). Scoville & Milner reviewed 9 patients who had undergone resection surgery, but the others were sufferers of schizophrenia and depression whose symptoms interfered with memory testing. H.M. was unusual in that he suffered from "clean" amnesia - his memory loss was his only problem. This makes him much more representative of ordinary people. On the other hand, H.M. was a "one-off" - a unique case. Scoville never performed this surgery again and modern resection surgery is accurate enough to avoid the sort of brain damage H.M. suffered. This means we can never be sure just how "normal" H.M. really was. Because no one expected the resection to cause memory loss, no one tested H.M.'s memory before the operation. 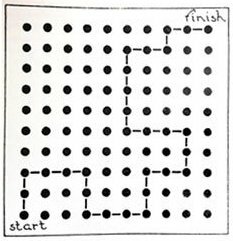 Milner used tried-and-tested memory tests and puzzles. Most of these had been designed by other memory researchers and many of them were replicated on H.M. by later researchers like Suzanne Corkin. They all showed consistent results with H.M. - a great example of standardised procedures and test-retest reliability. In fact, H.M.'s condition made him a great test subject. Since he never remembered having done the tests before, he never got bored of them and tackled them enthusiastically every time. On the other hand, the case study itself is hard to replicate. Now that H.M. is dead, there may well never be a patient like him again. You may be familiar with patients like Clive Wearing or the MTL patients in the Schmolck study. However, most of these developed brain damage through viruses or motor accidents. They don't have the "clean" amnesia of H.M. The application of H.M.'s case studies for psychology has been huge. Before H.M., psychologists thought that memory was a single function that took place all across the brain. After H.M., it became clear there are different memory functions that take place in different parts of the brain. By revealing the importance of brain structures like the hippocampus, H.M.'s case studies led to safer and more successful brain surgery techniques. However, some critics claim that H.M.'s case, being so famous, has led to too much attention being paid to the hippocampus and not enough to other regions of the brain linked to memory. Vann & Aggleton (2004) report the case of B.J. who had a snooker cue forced up his nose, damaging the base of his brain and causing amnesia, although his hippocampus was undamaged. Brenda Milner visited H.M. at his family home and tested him there. Although her memory tests were quite artificial, she also made observations about H.M.'s behaviour and habits - such as his watching old movies on TV without remembering having seen them before - which backed up the test results. Later, H.M. went to be cared for by Suzannne Corkin's team at Massachusetts Institute of Technology (MIT). This might have been a less natural environment for H.M., but, given his condition, he never noticed. In effect, all environments became strange for H.M., who couldn't even recognise himself in the mirror, let alone realise he was living in a strange place. The strength of H.M. as a case study is the validity of his condition: H.M. suffered from "pure" or "clean" amnesia with few other symptoms and was willing to work with researchers to understand the brain. H.M. consented to his surgery in 1953. No one warned him about the memory side-effects because no one understood the function of the hippocampus at that time. H.M. continued to consent to taking part in research for the rest of his life - every time it was explained to him, which was many times, daily, for over 50 years! Critics point out that H.M. was in no position to withhold his consent - he was entirely dependent on the researchers for his care and did not understand his situation. It could be argued that H.M. was a "human guinea pig" whose sad condition was exploited by researchers. However, the research followed the principle of Respect. Up until his death, H.M.'s real identity was kept secret to protect his privacy. Only 100 researchers were ever granted access to H.M., out of respect for his dignity. What's more, the research could be justified in terms of Social Responsibility. H.M. suffered from life-threatening epilepsy and in 1953 Dr Scoville cured this by removing H.M.'s hippocampus. As a result, H.M. suffered from retrograde amnesia (remembering only his life before age 16 with clarity) and anterograde amnesia (forgetting all his new experiences within 30 seconds). H.M. was visited by Brenda Milner who conducted tests on him like the star-drawing test and published several case studies on his condition in the '50s and '60s. Milner showed that, without a hippocampus, H.M. could not create new episodic memories but he could still learn semantic memories (like the moon landings) and procedural memories (like the star test or playing tennis). 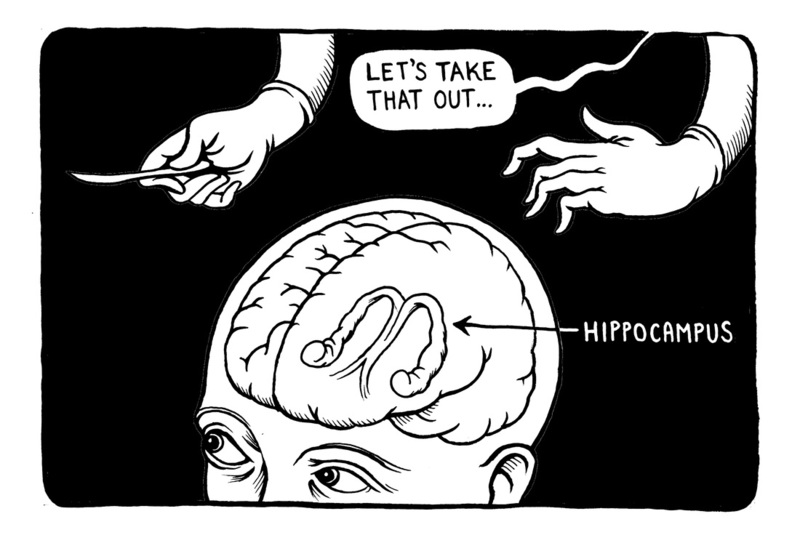 Before H.M., psychologists did not appreciate that memory was made up of different functions that took place in different parts of the brain, particularly the hippocampus. 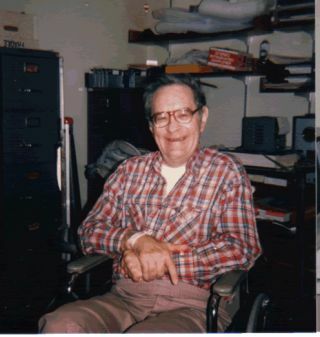 Milner's research on H.M. led to the development of the Multi Store Model and to Tulving's concepts of procedural and semantic memory as well as episodic memory. Some researchers argue H.M.'s fame has led to too much focus on the hippocampus: the case of B.J. whose amnesia was brought on by a snooker cue up the nose suggests other areas of the brain are important too. Now that H.M. is dead, his brain has been scanned and sliced into slides only 70 microns thick in order to help researchers understand the structure of the brain in more detail. H.M.'s value to researchers comes from his being a "clean" or "pure" amnesia sufferer who had very specific brain damage and no mental disorders other than memory loss. This has made him very valuable as a research subject. Notice that for a 8-mark answer you don’t have to include everything on H.M.. I haven’t mentioned the maze tests or details on how the star-drawing test worked. I haven't evaluated the studies in terms of ethics. But I have tried to make the two halves – Description and Evaluation – evenly balanced.